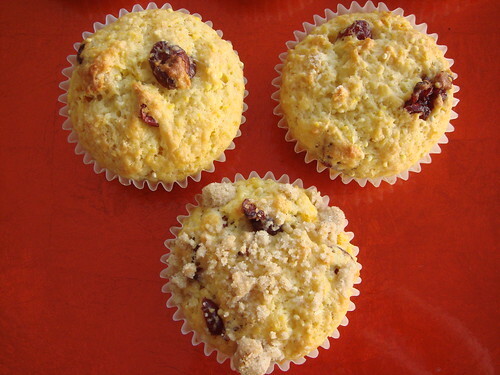 As much as I enjoy making sweet treats, I've never been a fan of confections in the kitchen. Baking is all about precision but candy-making is obsessively more so because of the high importance placed on temperature. Whether you're turning sugar to caramel or tempering chocolate to a shiny sheen, a few degrees off the target can be the difference between success and a gooey mess. I always welcome the addition of simple recipes to my collection and my recent purchase of The Best Of America's Test Kitchen: Best Recipes And Reviews 2008 contains one perfect example. 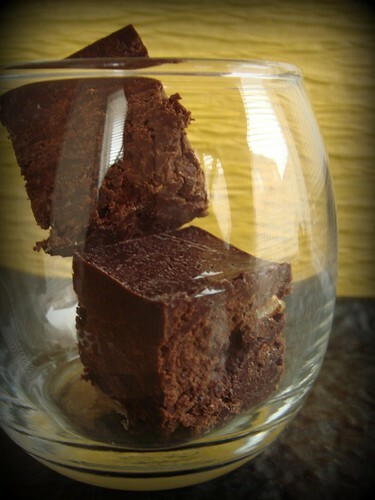 This fudge recipes does not require any confectionary-specific skills...the ability to scale out the ingredients is already half way to success! To cut down on preparation time, I keep boxes of finely chopped chocolate in my pantry. When I need them for any recipes, it's only a simple matter of scoop and scale. Bring half a pot of water to simmer using a medium size pot. It will be used to set up a bain marie. Line a 8x8 square cake pan with parchment. 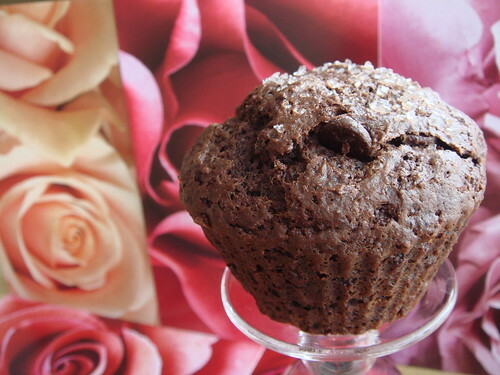 In a medium mixing bowl (completely dry), mix together chocolates, baking soda, and salt. Pour in condensed milk and vanilla. Set the bowl over the pot of simmering water to melt the ingredients by the steam, stirring occasionally for even melting. Remove bowl from heat when the content is melted. Stir in chopped walnuts. Pour into prepared pan and smooth with an offset spatula. Chill in the refrigerator for at least two hours. Unmold the fudge to a cutting board and cut into bite-size pieces. Store in a cool place between sheets of parchment paper. 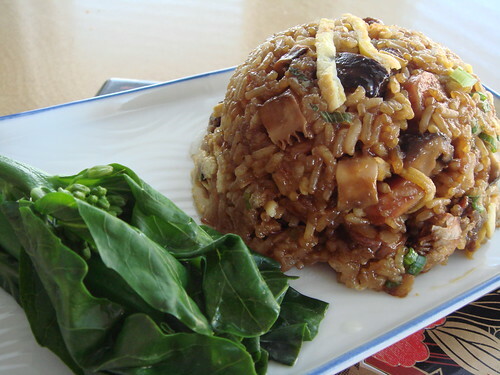 Glutinous fried rice is known as 生炒糯米飯 in Chinese, a typical comfort food in winter time. Although my specialty in the kitchen lies in dessert, I do enjoy cooking up a traditional Chinese meal every now and then, especially dishes that my brother enjoys very much. The inspiration for this dish was actually a little silly. I was watching a Hong Kong television show featuring one-on-one cooking lessons for celebrities. The episode starred Ella Koon, a pop singer who infamously earned the reputation of Master Chef From Hell because of her horrible cooking (watch the video starting at the 5:28 mark, she's the tall one in a grey shirt). One of the dishes which she learned to make was glutinous fried rice. There were plenty of tips discussed at the show so that got me interested. What I thought was a difficult dish to make is in fact quite simple. The following is my version. 5 hours before cooking, rinse the glutinous rice and soak with enough water in a bowl to cover all the rice. In separate containers, soak the shitake mushroom and dried shrimps with just enough water to cover. Bring a large pot of water to rolling boil. Drain the rice and briefly blanch in the boiling water for about 5 seconds. Drain with a fine sieve and rinse with cold water to stop the cooking. Set aside. Whisk the eggs and cook over high heat in a frying pan to make a thin omelette. Julienne finely and set side. Reserve the soaking liquid for the mushroom and dried shrimp. Dice the mushrooms. Using a frying pan at high heat, saute the cured meats with mushroom and dried shrimps until fragrant. Remove from pan and set aside. Lightly coat a wok with cooking oil at medium-high heat. Put all the rice into the wok, stirring constantly. Similar to cooking risotto, add the reserved soaking liquid to the rice and keep stirring until the liquid is absorbed. Repeat this process with chicken stock as many times as necessary until the rice is cooked. It will be sticky because this is glutinous rice! It only took me less than 5 minutes, much quicker than risotto. That's because the rice was soaked and blanched earlier. Mix in the cured meat, mushroom, and dried shrimps. Season with dark soy sauce and soy sauce to taste. Mix in green onion and egg. Serve immediately. Happy Easter and Happy Birthday to Dessert By Candy! Today I'm celebrating the third anniversary of my blog except that it is a little dorky excuse for a celebration...so I'm celebrating Easter instead. 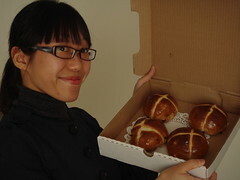 On this special day, I visited Brick Street Bakery in the Distrillery District for some much-sought-after hot cross buns. If you only know hot cross buns by its supermarket counterpart, you must try one from a good bakery. These hot cross buns are deeply flavourful from both the sweet spices and dried fruit, as well as the bread itself. The top is glazed with a sticky glaze which gives the bun a little caramel flavour. The best part of all was the crunchy cross. Too bad I'll have to wait another year until I can tastes these delicious bread again. Chocolate boutiques are tremendously fun to visit around Easter time because every chocolatier would fill his shop to the brim with all kinds of whimsical chocolate eggs, bunnies, and chicks. Soma is no exception. I marvelled at the metre tall chocolate egg on the display. For $225, you can call it your own! However, I went for something a little less dramatic. 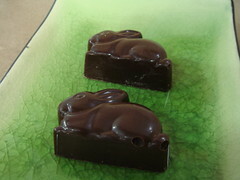 I enjoyed a piece of their limited edition bunny truffle filled with pistachio paste. It was a joy to bite into a truffle with properly tempered snappy dark chocolate shell. The pistachio paste was smooth and rich...like a marzipan but only better. Highly recommended for all you pistachio fans out there! Have You Had Your Zeppole Yet? Inspired by Rob's search for doughnut last year, I was determined to seek out zeppole before they disappear after Easter. Coincidentally, I came across a write-up from Toronto Life which heaped praises on this Italian pastry so there was no escape from a visit to an Italian bakery before Easter. Italian pastry is something which I am rather unfamiliar other than the fact that I adore eating panettone and biscotti but hate making tiramisu. I was dazzled by the selection of specialty Easter bread available at Aida's Pinevalley Bakery in Woodbridge. 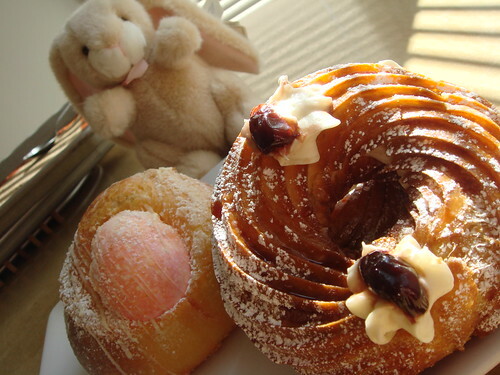 Aside from zeppole, there were all kinds of enriched sweet bread including Columba Pasquale in dove shape and glazed with chocolate. 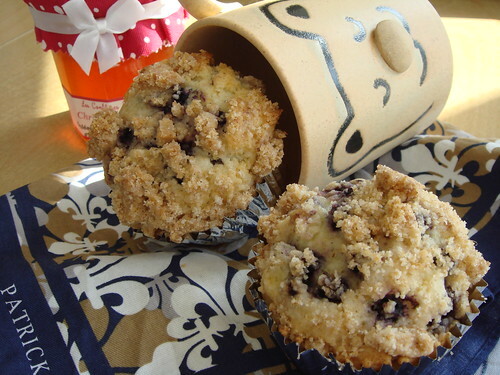 The ones that really tickle my fancy are the bread embedded with Easter eggs. I know that it is very symbolic yet a tinted hardboiled egg (with shell!) inside fluffy bread makes no sense to my baker's mind. All the more reason why I had to try it myself! I love oatmeal for as long as I can remember. For the longest time, the only way we cook oatmeal at my house is over stovetop and enriched with milk, condensed milk, and eggs. Instant oatmeal is frowned upon in my family so it's really only an option for camping. 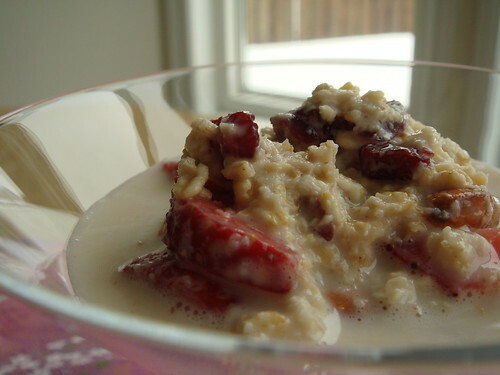 However, I am really not too fond of scrubbing pots early in the morning so oatmeal is definitely a weekend treat. Recently I found out that fresh muesli is another way of enjoying oatmeal. I used to buy fresh muesli all the time from Mövenpick Restaurant. However, since they closed the doors in Ontario, I have not had any fresh muesli since. The best part about fresh muesli (other than the fact that it tastes great) is that it does not require any cooking! Most of the preparation can be done the night before so it will be ready for breakfast the next morning with only minimal work. Trust me, it's so simple that you don't even need your morning coffee in order to make it successfully. The night before, layer all ingredients in the order listed in a big container. Store in fridge. Before serving, stir everything until thoroughly mixed. Enjoy! Makes about 4 servings. 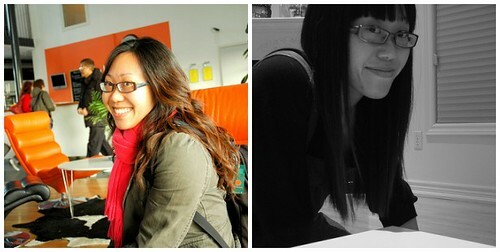 After getting my haircut on Saturday, I went for a bit of shopping in downtown Toronto. The West Queen West neighbourhood is one of my usual haunts but obviously I haven't gone into every single shop yet. Babies and pregnancies have been made "fashionable" in the last few years so by the rules of supply and demand, of course there are some pretty cool stores catering to hip moms with money to spend. Not being in that target demographic myself, I rarely ever set foot inside these too-precocious-for-words stores. I was walking along Queen Street West, comtemplating on getting some fish 'n chips from Chippy's, when my attention was drawn to a window display full of bunny rabbits and cookie cutters. Window shopping is about taking in the beauty of pretty things so I went inside to take a closer look. I quickly found myself surrounded by many cutesy pastel things that can only mean I was inside a [gasp!] kids' store. 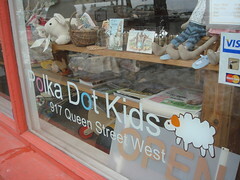 However, Polka Dot Kids is not just about being precocious. 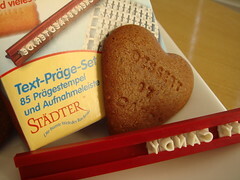 This store carries a large selection of cookie cutters made by german company Städter (check out their online catalogue). These are not run-of-the-mill cookie cutters. There are polar bears, penguin, squirel, castle, princess, ballet slippers, fork, spoon, knife, sheep, specialty Linzer cookie cutters, etc in sizes big and small. These cookie cutters are well-made in intricate shapes. 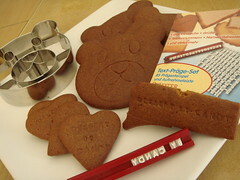 The best find of all was a set of customizable cookie stamp also made by the same company. This stamp set comes with a set of alphabets and numbers which I can mix and match to form different words on the mounting sleeve. The stamp can be used on rolled out cookie dough before baking. Can you imagine the possibilities of all the personalized cookies that I can made? I can include cookies with my own "Dessert By Candy" branding in my annual holiday cookie assortment. I can make cookies with my contact information ("Can I have your number?" "Sure! Here, have a cookie."). Oh oh, how about a box of cookies full of insults? I am so amused by all the ideas!